So I’ve got a pretty important tournament coming up at the release of Shadows over Innistrad so I’ll let you know what financially relevant information I’ve gathered from decks I’ve been seeing. Here‘s a rough idea of what this deck might look like. It’s still very rough (like many of these deck lists) but we can glean some of the more powerful cards from it. Always Watching is soon to become a lynch pin in a very aggressive day 1 deck. They are easily found right now for a buck or two and can see a big camera spike this weekend if they get a lot of camera time at SCG Baltimore. Thalia’s Lieutenant looks pretty mediocre at best but there are a large number of aggressive 1 mana humans that can lead the stampede. I recommend grabbing a few if this kind of deck is your jam. These mythic rare white creatures might finally see their last big hurrah. Both creatures benefit greatly from the vigilance granted by Always Watching and have already seen an uptick in price the last few weeks. I would dig out any extra copies you may have and not want to play with. Pro Tour weekend could be big for these two mythics before they start their final descent. 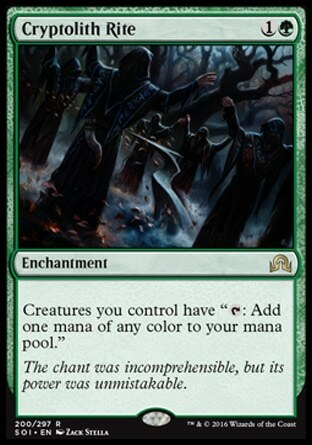 “But it’s not Path to Exile!” is what most people say looking at this card. But in Standard it will be pretty close to Path to Exile. I am expecting to see people quickly increase the number of these they want to play in their decks until they can’t play any more. At $3-4 I’m not thrilled buying them but they’re a very important piece of the human deck. The original version of this deck has already spawned many offshoots but remains here. The gist of the deck is to play many small creatures and some that produce tokens(like Hangarback Walker and Scion Summoner) to funnel mana into Cryptolith Rite to cast some big spells or use Evolutionary Leap. Cryptolith Rite has already seen a spike as more people caught onto its power on Reddit. 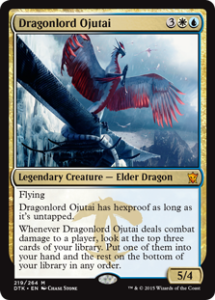 It started as a G/B deck to fuel Ulamog and Zendikar Resurgent but people have been testing it to ramp out Dragonlord Atarka as well. I’d say there is “something there” but it might take a few weeks for people to find the most optimal way to use this card. I don’t like holding my copies mostly because I think this card gets drastically worse once Hangarback Walker rotates in October. 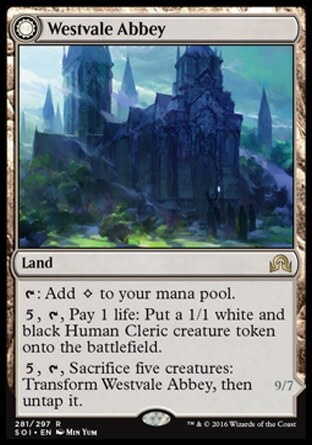 Westvale Abbey was first on everyone’s radar in this deck. It was a very reasonable way to turn a bunch of thopters or scions into a formidable 9/7 flying, lifelink, haste, indestructible creature. That has driven the price of this sky high as people realize you can just play it in anything really. It’s great with Secure the Wastes and does a decent Vitu-Ghazi, the City-Tree impression. I think the price point looking a few months out will likely be around $10-12 if it puts up results. If not, it will likely fall to the $4-5 range quickly. This will likely be a player in some form in the near future. It has the most options to stop the most varied threats. You can find a decklist and some play testing by Michael Majors here. 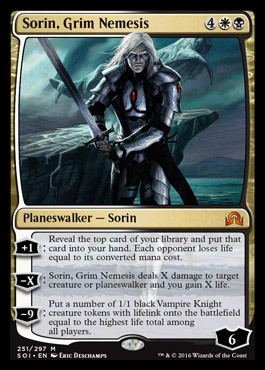 Sorin is very good on a clear board. 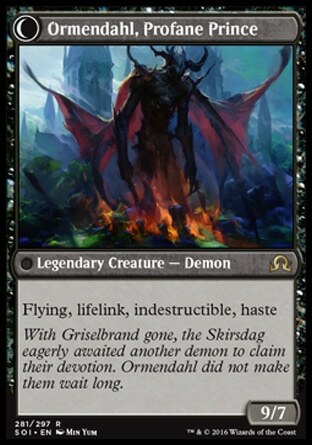 He doesn’t usually kill quite as fast as Chandra, Flamecaller but he will allow you to play a very grindy game that White-Black Control is definitely well equipped to fight. Going up to 7 loyalty means Chandra cannot immediately kill him without help. 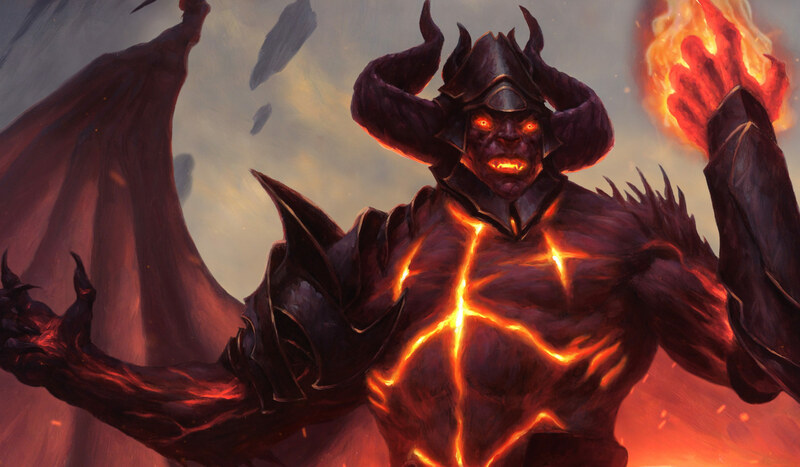 I don’t forsee him finding Elspeth, Sun’s Champion or even Chandra, Flamecaller levels of play so his $20 price tag right now seems unsustainable. He may see a quick peak during Pro Tour Shadows over Innistrad weekend but I’m not in any rush to buy in here. 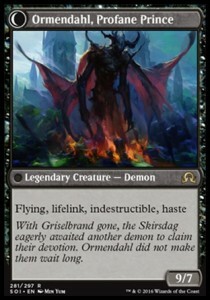 If you don’t play Standard you can likely pick him up in late August or early September for $6-10. 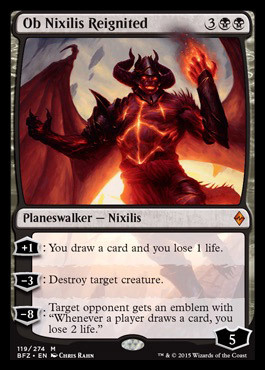 Ob Nixilis is the king of Standard 5 mana planeswalkers right now (I feel). His buylist price has seen about a 25% jump in the past month but some retailers have been slow to follow suit. As you can see here the spread among vendors is still pretty big. At the time of writing (Sunday night), the highest buy price (Channel Fireball) is 60% of the lowest sell price (Strike Zone online). In fact, Strike Zone is currently cheaper than all but 1 of the listings on TCGPlayer. All of this points to Ob Nixilis likely being on the move soon. I wouldn’t be terribly surprised if he jumps to $15 for a month. Languish was relegated to the side lines in the face of the Siege Rhino menace. As Siege Rhino’s last farewell it will drag Languish back into the fold. 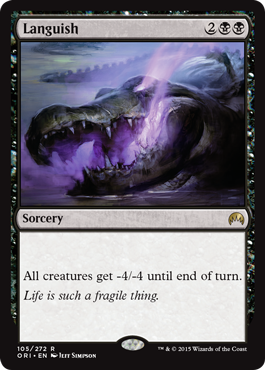 It being a turn faster than Crux of Fate and being able to kill larger creatures than Flaying Tendrils means it will likely become the sweeper of choice. With B/W control intentionally being light on creatures it would make sense to support this. On a related note, Languish is not able to be stopped by Archangel Avacyn. 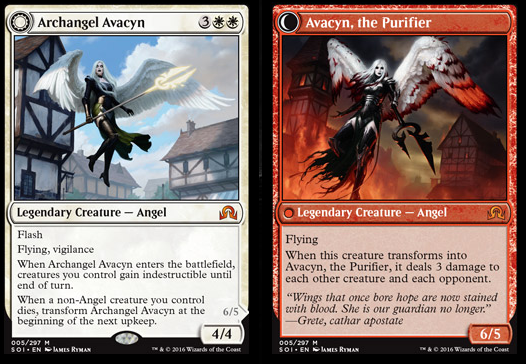 Speaking of Avacyn…. It’s odd to see Majors not playing any copies in his 75. 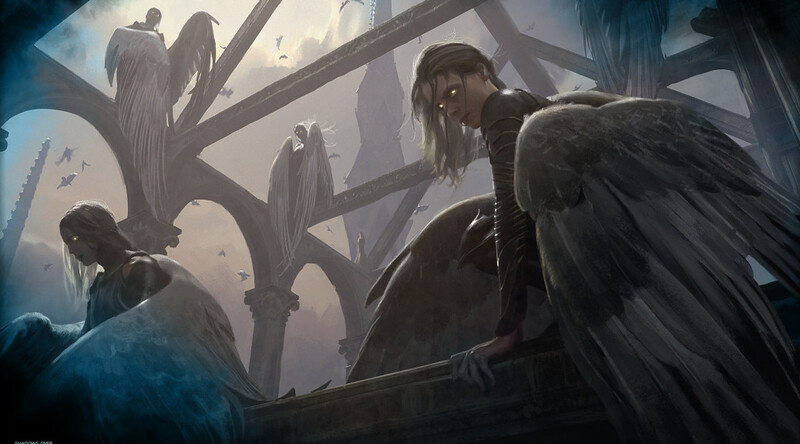 Avacyn can quickly close out games and often can be masked with an activation of a land (like Shambling Vent or Blighted Fen) or just an instant speed removal spell. This card has doubled since it’s debut pre-order price ($15). At $30 I’m pretty happy selling her and re-purchasing them in June. 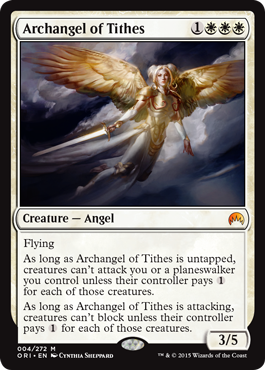 I’m expecting her to hold a reasonably high price due to being a legendary angel and a flip mythic. I don’t think it’s unreasonable for her to maintain $10-15 price tag in June. 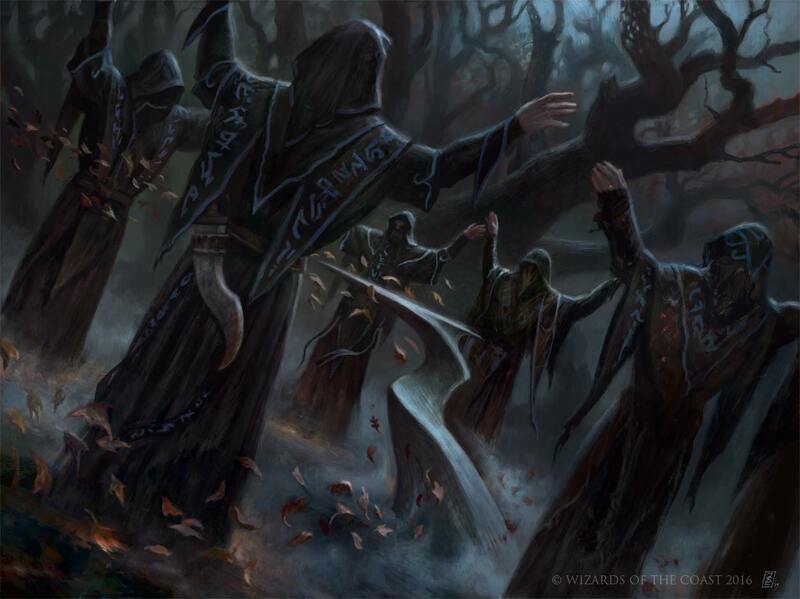 This weekend we will get the first taste of Shadows over Innistrad and the day before my article comes out we should get the Modern ban list shake up. Hopefully we’re in for a great weekend of Magic and we can talk about it next week! Prerelease foil Avacyn – hold or sell?